Here is a tasty and simple way to cook up those long crunchy green beans you have in your refrigerator. 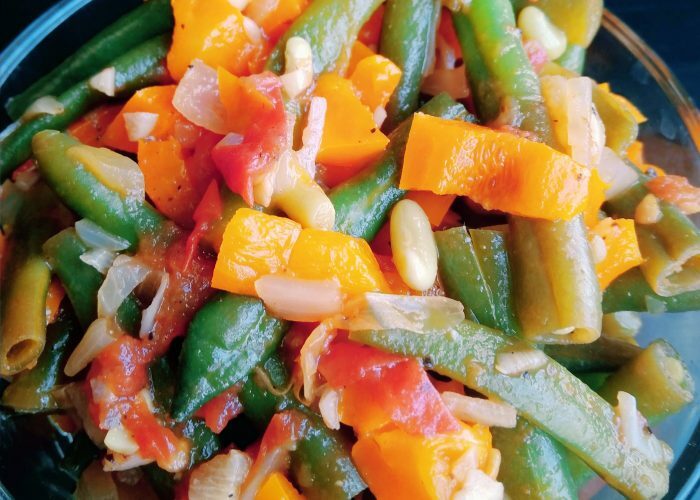 This colorful plant-based Flavorful Cayenne Green Beans dish pairs well with any main course dish or can be eaten on its own with your favorite grain or gluten-free alternative. Feel free to add more cayenne pepper into this recipe if you want more of a ‘spice kick’. Conversely, you can choose to omit the cayenne pepper to produce a non-spicy version if your children do not like spiciness. It will still taste delicious! In my opinion, I think this vegan, dairy-free, nut-free, egg-free and gluten-free side dish is even more tasty the next day cold after refrigeration so you can try it both ways. Freeze any leftovers or double the recipe to make enough to enjoy on another night during the week! If you would like the green beans to be less crunchy (for example, for young children), let the green beans simmer longer in the pot until more cooked through and softer in texture. For little ones, you can slice up the green beans to smaller pieces if this will make it easier for them to handle and chew. My 25 month old, however, was able to eat the green beans halves whole or chopped up! A flavorful and colorful tasty plant-based, vegan, dairy-free, nut-free, egg-free, gluten-free side dish to pair with any main course dish. Prep the green beans by washing them, cutting both ends off and then cutting the green beans in half. Mince the garlic cloves and dice the onions, bell pepper and tomatoes. Add in the cut green beans, chopped tomato and bell pepper pieces, along with the rest of the vegetable broth or water. Stir the contents until combined, then cover the pot and let the contents simmer for 5 minutes. Uncover the pot, stir the contents then add in the salt and ground black pepper. Stir until combined. Taste a green bean or two to see if you need to cook it longer and also to adjust the seasonings if needed. If the green beans are not cooked through yet, cover the pot and let the contents simmer a few minutes longer (you can add in a bit of water or vegetable broth if needed to keep the pot contents from drying out). Add in the cayenne pepper (optional). Turn off the heat and serve!